The Mo’ Wine Group’s latest agency tasting was led by La QV’s head honcho Cyril Kérébel. The wine-up featured a particularly high proportion of whites, all with great minerality and a saline edge, as well as a wowser rosé and a handful of super-drinkable reds. We began with a trio of new-to-most whites from one of our favourite producers. A blend of Grüner Veltliner (50%), Welschriesling (40%) and Muscat Ottonel (10%) from biodynamically farmed vines. Manually harvested. Fermented (with indigenous yeasts) and matured in stainless steel tanks. Screwcapped. Residual sugar: 4.9 g/l. 12% ABV. Quebec agent: La QV. 100% Hárslevelü from biodynamically farmed vines grown at the base of the extinct Somló (pronounced shom-low) volcano in southwest Hungary, not far from the Austrian border. The must is passed through a coarse filter before fermentation. The wine-making – which takes place at the estate’s Burgenland winery – is non-interventionist, with no additions except, possibly, a tiny squirt of sulphur at bottling. Matured in stainless steel tanks and old oak barrels for 12 months. Residual sugar: 4.2 g/l. 12% ABV. Quebec agent: La QV. A field blend of three Gewürztraminers, specifically Red Traminer, Yellow Traminer and plain old Gewürztraminer. Macerated on the skins for 21 days. Vinified in egg-shaped concrete tanks. No added anything, including sulphur. Residual sugar: 1.6 g/l. 12% ABV. Quebec agent: La QV. 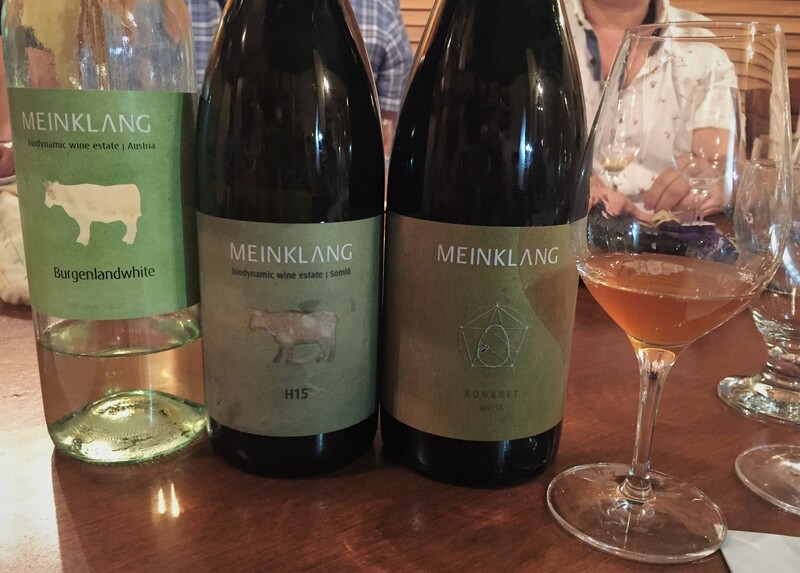 And Cyril shared some good Meinklang news with us: the SAQ will be including their impressive “Graupert” Pinot Gris in its Opération vins oranges release this fall and will also be carrying their fine ancient grains beer.